Sympathy is a sense of pity and an ancillary feature of kind-heartedness. It is an extension to the virtue of generosity. The sight of helpless living beings in a state of grave peril certainly evokes a sudden sense of ruth in the mind of humane souls. It is quite possible that with no apparent reason one can nurture a good opinion or a positive feeling about somebody or even animal or a plant. Existence of love, affection or fondness breeds pitifulness. When the nexus of love grows stronger, the underlying sense of pity too gets strengthened substantially. Sympathy is the favourable feeling about a living being that is helplessly stuck up in a situation. There is a possibility for developing soft corner about the person who seems to be in a really pathetic condition. Sympathy prompts to go to the rescue of an individual, to go to the root of his sufferings, to cognize the enormity of his grief and to explore the possibility of lending a helping hand for eventual total remedy to the hardships. The more the seriousness of the problem, more would be the intensity of sympathy. A person who has just met with a road accident sustaining fatal injuries is more likely to evoke an immediate act of practical help than a man suffering from common cold. A helpless cancer patient elicits more passionate supportive gesture than an individual undergoing treatment for mild fever. When a person is rapidly approaching the brink of death in an utterly helpless situation, he is more likely to stoke stronger pangs of sympathy. In order to ignite sympathy, a man should either be closely related to the observer, or his dear friend or totally a strange person entangled in an utterly helpless life-threatening situation left with a very short time to live. The graveness of the problem need not always be associated to the life risk, it could even be acute poverty, pauperization etc. The practical aspect of sympathy comes into picture when the sufferer becomes absolutely defenceless. If the concern for the well-being for everybody prevails in our mind, we tend to extend practical help to the hapless victims. A great incident of in the life of Gautam Buddha, the founder of Buddhism and great sagacious preacher of non-violence, describes how the helplessness of a victim educes sympathy. Gautam Buddha was born as prince to the king Shuddhodana and the queen Mayadevi in 563 B.C. in the kingdom of Kapilavastu. When he was born after many years of despair suffered by his parents due to childlessness, he was nurtured by his parents with deep emotions of love and affection. His initial name was Siddhartha. Paying heed to the prediction of the royal astrologer that Siddhartha would either become a victorious King or a brilliant sage, the king Shuddhodana took every care to ensure that Siddhartha enjoyed all the worldly pleasures in royal stature and not a slight trace of spiritual ascetism entered the prince’s mind. Siddhartha grew up well happily in his boyhood relishing the luxurious life that his royal status had brought to him. Amid plenty of love and endearment from his parents and all the people around him, Siddhartha developed in his mind the positive thoughts of love, kindness and compassion for others. He played joyfully in the company of his cousins, friends and his teammates. The magnitude of affectionate attention received by Siddhartha became the prime cause of jealousy for his cousin by name Devadatta. One day, Siddhartha was playing happily with his friends by the shore of a pond in the royal palace. Suddenly, much to his pleasant surprise, a group of white swans flew down and began swimming in the pond waters. The beauty of impeccable whiteness of swans held Siddhartha awe-struck and he kept watching the playful birds without batting an eye lid. Every act of the birds, be it splashing the waters or twisting their long supple necks to preen their plumes with their red beaks, was a pleasant sight to watch and it was really a spectacular feast to the eyes. As if to disturb the tranquility, then came down an arrow from nowhere, tearing through the air and got planted itself on one of the swans in the pond. Unable to bear the pain, the swan began to cry in excruciating agony, bleeding profusely. Moved by the unexpected sudden tragic sting of fate, Siddharth rushed to the wounded bird to its rescue. Siddarth, without waiting a second, carefully removed the arrow from the bird, washed gently the wound, ordered for an unguent, applied it on the wound in a measure of the first aid treatment and tore a piece of cloth from his garment, tied it on the wound to stem the bleeding. Siddharth’s cousin Devadutta came running after and claimed that the swan belonged to him because it was he who shot the arrow at the bird. Siddharth gently refused to hand over the bird to Devadutta stating that the swan belonged to himself as he saved the life of the bird. For seeking a settlement over the dispute, both of them approached their Guru to seek justice. The Guru, after a keen deliberate consideration on the fateful incident, gave the verdict that the swan rightfully belonged to Siddharth because it was he who loved the bird from the bottom of his heart and the bird could get the safest lifelong shelter in the hands of Siddharth and those who did harm to helpless living beings could not claim any moral right on them. Siddhartha, later grew up observing the various sufferings and misery undergone by various people and other living beings, abdicated the kingdom and went on to become one of the supreme spiritual personalities in the world. The doctrines and the moral principles he preached to the people endowed him the stature of a heavenly divine soul and a new religion Buddhism was established in his name which continued to flourish well even today, followed by billions of followers in many countries across the world. What made Siddhartha rush to the rescue of the wounded bird, even though the swan was not reared by him before the incident? How come that Siddhartha had forgotten to wipe his own tears, while attending to the lamenting bird? Why was Siddhartha so possessive about the swan wailing helplessly? Why did the heartbeat of Siddhartha escalate up at the very sight of crying bird wriggling in agonizing pain? Why did Siddhartha undergo the pangs of mental trauma, as if the arrow was darted off to pierce his own body? The single answer to all the above questions is sudden surge of compassion, called sympathy, born out of unblemished love. For sympathy to spring up from the heart of anybody, no previous acquaintance is compulsory, no pre-existing bond of friendship or relation is mandatory. You would lose no time in coming to the rescue of anyone, involuntarily, if there is an underlying feel of compassion in you. If the intensity of your affection is too strong, it might even be possible sometimes that you would find yourself having taken immediate course of practical action, without deliberate pre-planning for it. 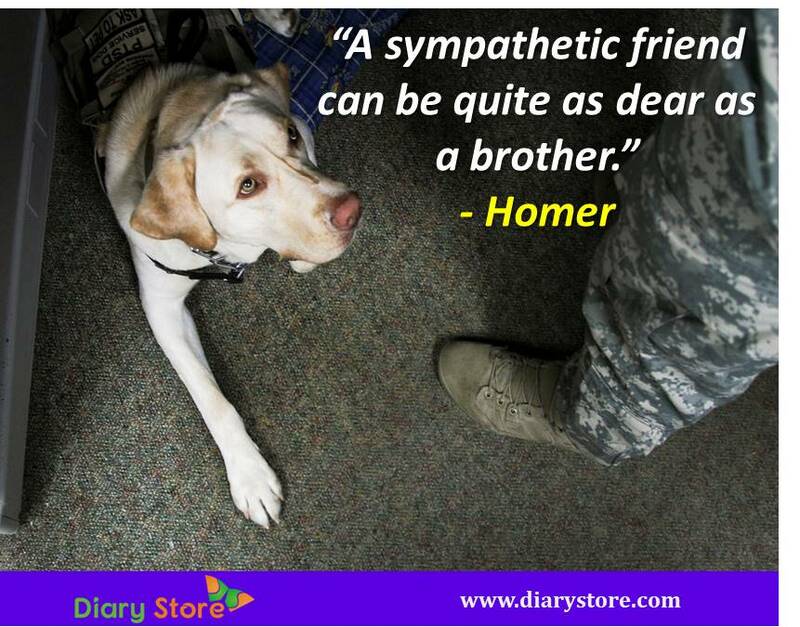 Sympathy is unquestionably, a positive feeling to view the plight of others with a sense of compassion and pity. It certainly builds strong interpersonal relations and reinforces the noble trait of humanity in the world. The nature thrives well, inclusive of all the flora and fauna, if the inhabitants with their minds filled with kindheartedness dwell on the blue planet. Loss and possession, death and life are one, There falls no shadow where there shines no sun. Character is made of duty and love and sympathy, and, above all, of living and working for others. I've never wanted sympathy votes in anything I do in my life. I'm completely indifferent to what genre I read provided that I feel sympathy with how a writer perceives being alive in the world.